” Direct Action: Legal And Illegal Adverts contribute towards site running costs, but currently may not fit with the site ethos. We will continue to work on a solution. Direct Action can take many forms, and can be both legal and illegal. Legal forms of direct action can be, for example, organising or taking part in a boycott, or protesting on the street or other public place, whereas illegal forms can be such things as vandalism, arson, and rescuing of animals, which is considered theft of property. 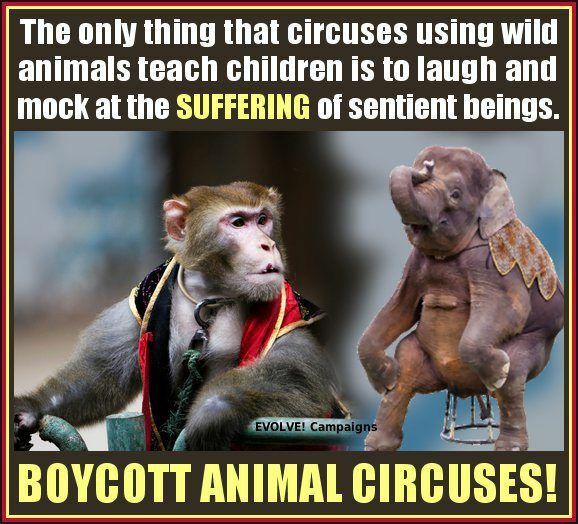 Image: A call for people to boycott circuses with wild animals in. Many animal rights activists feel very passionately that the law is morally wrong when it allows animals to be exploited and abused, and protects the exploiters and abusers instead of the innocent animals. Although the activists do not take pleasure in breaking the law, they feel passionately enough about protecting animals to do it. They look forward to the day the law will protect the animals instead of them having to. 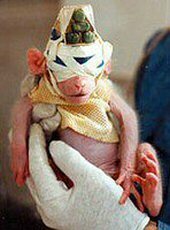 Image: Britches the lab monkey, who was rescued by Animal Liberation Front Activists, had had his eyelids crudely sewn shut at birth and a probe attached to his brain. Parallels can be drawn between the unlawful direct action animal rights activists take today, and that taken during struggles to end injustice of the past. These include the Underground Railroad, or those who helped Jewish people escape the Nazis. While those people were once seen as criminals, they are now celebrated as heroes. Animal rights groups and activists both past and present have used illegal direct action tactics and achieved much success. However, for those caught, sentences can be very severe. Without their sacrifice, much animal suffering would have gone unseen, and illegal cruelty unpunished. 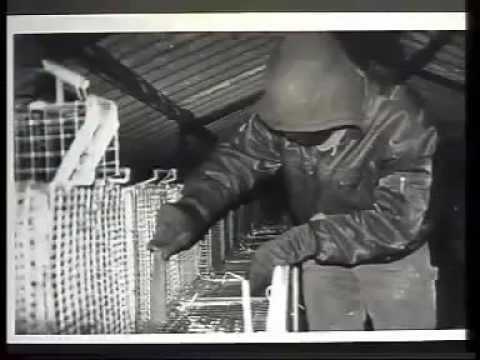 For example, raids (investigations and rescues) by the Animal Liberation Front (ALF) have not only exposed the truth of what happens to the public, but has also resulted in officials filing criminal charges against laboratories, and citing experimenters for violations of the Animal Welfare Act. Image: Activist investigating a facility and rescuing animals. There have been numerous examples in the past of where the law has been broken to combat injustice. Here are just two of them. The Underground Railroad, the French Resistance, and the people who helped Jews escape the Nazis are just three of them. The Underground Railroad was, with the aid of abolitionists and allies who were sympathetic to their cause. 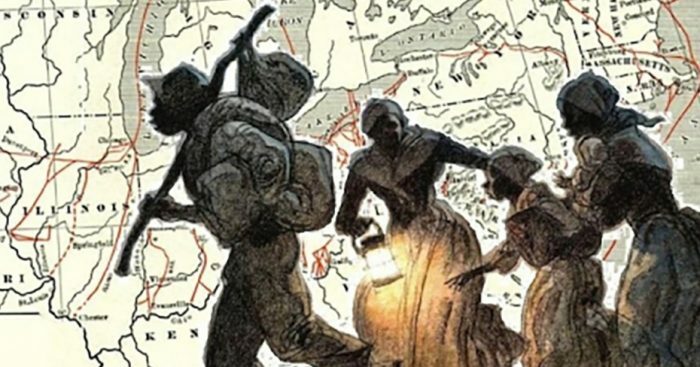 a network of secret routes and safe houses established in the United States during the early to mid-19th century, to help African-American slaves escape into free states and Canada. Brave people against the holocaust helped Jews under threat from the Nazis by hiding them and helping them escape – all at the risk of their own lives. It was all illegal, but those brave men and women knew it was the right thing to do. 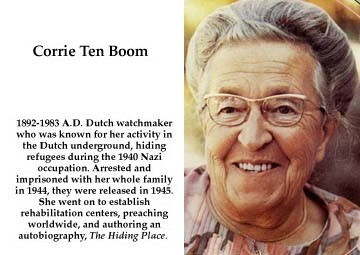 Image: Corrie Ten Boom and her family helped many Jews escape the Nazis by hiding them. It was illegal then, but she is now called a hero. Comparisons can be drawn with the unlawful direct action of today being done to end injustice to animals. Many animal rights activists see the enslavement, exploitation and abuse of animals for profit as a holocaust itself. While it is against the law, activists undertaking illegal direct action are called terrorists, extremists, fanatics and criminals. Only after liberation has been won, are activists like all of these no longer called terrorists, and are even hailed as heroes. 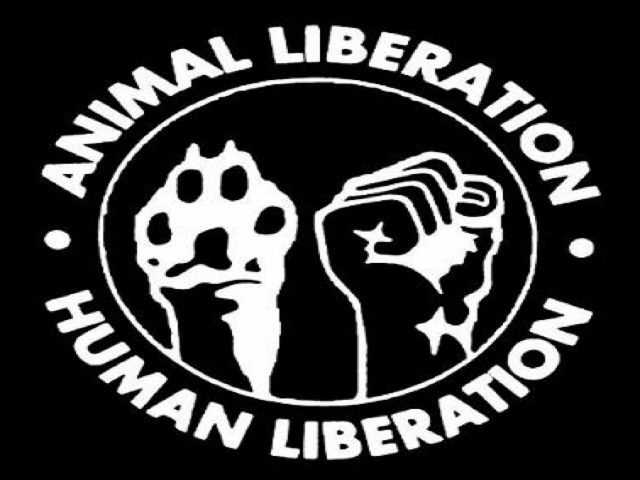 The Animal Liberation Front was possibly the most well known animal rights group of the 1980s. It was largely responsible for bringing animal rights to the fore, and it still continues to fight for animals today. The ALF have always had a rule of strict nonviolence towards sentient beings, including humans. However, damaging property used to abuse animals is legitimate. For certain other animal rights groups of the era, violence against human animal abusers was not prohibited. ALF activists document and expose cruelty behind closed doors that otherwise the public would never know about. Prosecutions have occurred due to ALF evidence. The ALF are a leaderless and decentralised group. This means there are separate groups of people, or individuals, who abide by the rules of the ALF and undertake direct action in its name. 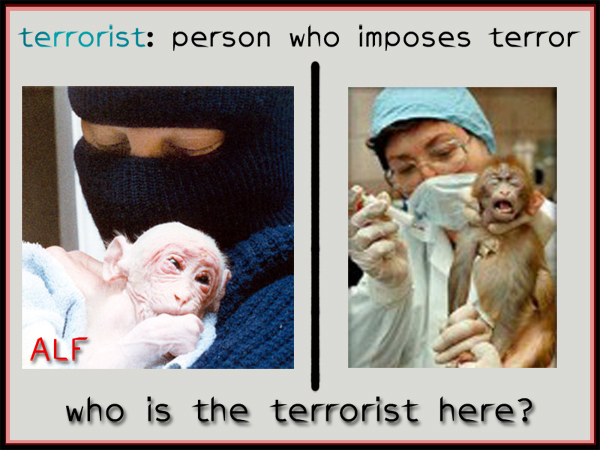 Image: Some people regard the ALF as terrorists, and at the least, extremists. In 1977 activists caused £80,000 damage to a laboratory in North London, which went bust afterwards. Although they kept their identities secret, the ALF publicised their animal lib activities in the “Diary Of Actions” section of a their newsletter, Bite Back. 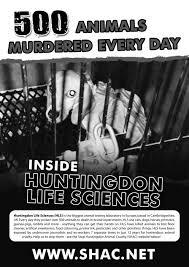 Some of their direct action attracted press coverage, such as when they coordinated nationwide actions against the homes and cars of 40 vivisectors, and when they raided – among other animal testing laboratories – Life Sciences Research in Essex, rescuing animals and causing £76,000 of damage. 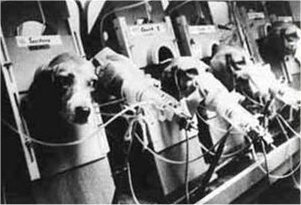 In 1981 the ALF raided Boots the Chemist’s lab animal breeding centre, in which they saved 12 beagles. The chemist later outsourced its animal testing division. 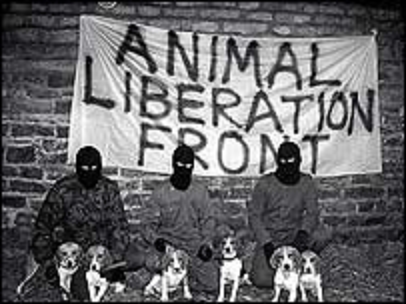 Image: The Animal Liberation Front with six beagles they rescued from a research laboratory. Another closed down after its windows were smashed. A hotel ceased its fur shows after being “gas bombed”, having its windows smashed, and slogans daubed on its walls. Debenhams’ fur department closed after a campaign by activists. The owner of a mink farm went bankrupt after it was raided by ALF activists. Nearly 3000 mink were sprayed – rendering them economically worthless – and 30 were released. Tractors and fences were also damaged. 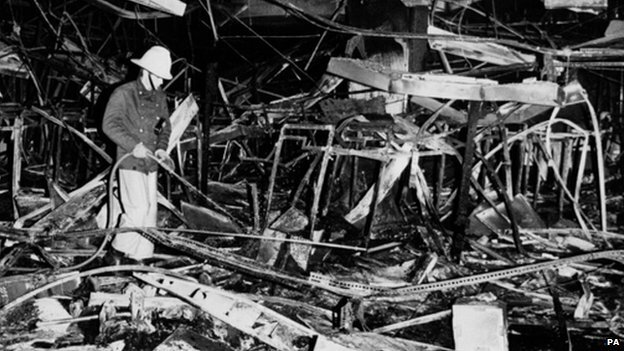 The Allders department store closed its fur department after ALF action was relentless: customers were leafleted and 600 boycott pledges were obtained; timed incendiary smoke devices were put in the store, setting off the sprinklers and causing £500,000 in water damage; 27 windows and six doors were covered in glass etching fluid; their lorries were destroyed at a cost of over £60,000. After that came an enormous increase in actions against high street targets including butchers, burger bars, Boots the Chemists, furriers, cancer charities and fishing tackle shops. Image: ALF claimed responsibility for various Debanhams Department Store fires in protest of them selling real fur. The Bite Back newsletters, publicising the direct action, had page after page of reports of damaged windows and cars, painted slogans and glued locks. In November 1984 the ALF claimed it had injected Mars Bars across the country due to the company funding tooth decay experiments on animals. Millions of bars were removed from shelves at a cost of over £3m to Mars. In the 90s the ALF was still going strong. In March 1990 they rescued 82 beagle puppies and 26 rabbits from Harlan Interfauna, supplier to some of the country’s main vivisectors, such as Boots and Huntingdon Life Sciences (HLS). Image: ALF activists with rabbits saved from an animal testing laboratory. In November the ALF activists raided a Boots laboratory and rescued eight female beagles. It was reported that 60 of its store branches were damaged by the ALF activists every month. They soon sold the vivisection division of the company and outsourced. Image: Lab beagles being purposely given cancer. 1991-92 saw a huge amount of direct action against the meat trade in northwest England, with up to 100 lorries destroyed at a cost of over £5m. 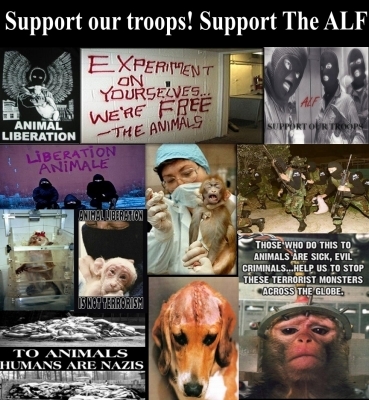 Although the ALF was still very active in the mid 90s, the Government clamped down on the key ALF activists, calling animal liberationists terrorists, giving them harsh sentences of over a decade in prison, and not allowing them to have any links with animal rights again. Despite the police oppression, the ALF newsletter, that is now published online, continues to have many contributors to its Diary Of Actions, here. They also publish details of ALF prisoners that have been imprisoned due to illegally helping animals. They ask that these prisoners are sent messages of support. Stop Huntingdon Animal Cruelty, (SHAC) was also a decentralised, militant animal liberation campaign group active in the US and UK from 1999 to 2014. It repeatedly brought Europe’s largest animal testing company, Huntingdon Life Sciences (HLS), to the brink of bankruptcy. Without Government intervention, it would not have survived. In addition to directly targeting HLS, SHAC campaigners focused on the company’s investors, suppliers and business partners, in an attempt to isolate HLS from funds, supplies and clients. Tactics included demonstrations outside investors’ homes, destroying investors’ possessions, and rescuing animals. By 2009, about 250 companies, including Citibank, HSBC, Marsh, and Bank of America, had dropped their business with HLS. By the campaign’s end in 2014, HLS was $100 million in debt. 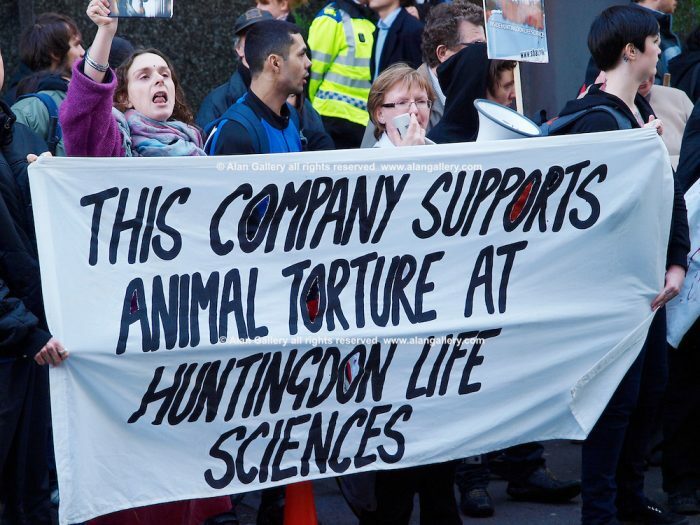 Image: SHAC protest at London Stock Exchange against one of Huntingdon Life Sciences supporters. The only reason SHAC was forced to end its campaign was because of unrelenting Government Repression. The Government repeatedly created laws to clamp down hard on activists, thus protecting the animal research industry. Dozens and dozens of its prominent activists, like those of the ALF, were given severe sentences of years in prison. Many SHAC supporters were also ALF supporters, and vice versa. Together the groups successfully kept animal rights in the public eye. "If they haven't got prisoners, we have stopped fighting. If our prisoners are forgotten about, they have beaten us. " Open rescue is a method of protesting animal exploitation. It involves entering facilities where animals are being used and killed, taking photographs and video to document conditions, sometimes rescuing a number of animals from the facility, and then publicising their findings. 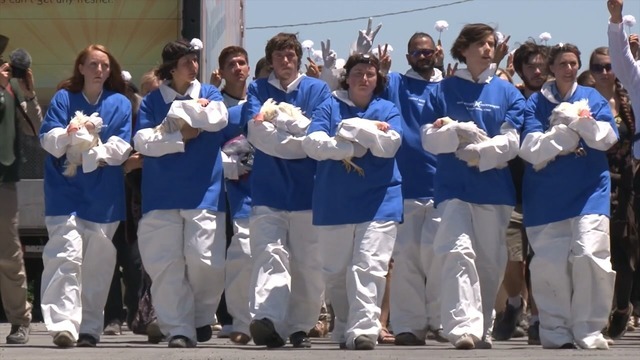 Image: Out of 500 activists rescuing sick animals on an open rescue, 40 were arrested. 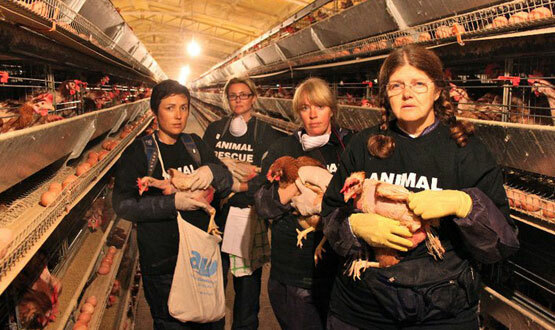 The aim of an open rescue is to expose cruelty that is kept out of view of the public, raise awareness of the injustice of what is happening to animals, dispel misinformation about the issue, and protest against the animal exploitation. Open rescuers are investigators as well as rescuers. It is called “open” rescue because activists do not attempt to conceal their activities, the place they have entered, or even their own identities. Image: Animal Liberation Victoria on an open rescue. Some open rescuers claim to have acted in defense of others, and so are not guilty of any crime, especially if animals have not been kept in accordance with laws. However, such a defence rarely works. 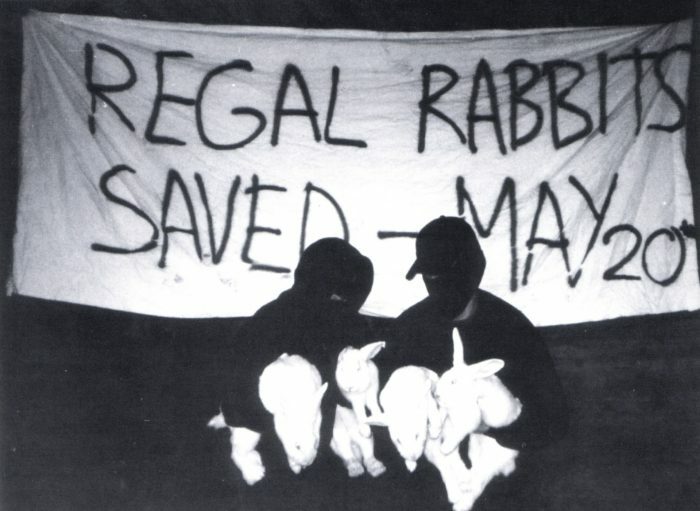 The methods of Animal Liberation Front activists differ to open rescuers in that ALF activists often vandalise or destroy property, especially equipment used to cause animal suffering. This is to cost the target money and render the equipment or facility unusable. They also traditionally conceal their identities. Theit methods are similar, however, in that they enter properties to document conditions and rescue exploited animals, and they publicise their activities. Anyone affiliated with any organisation, or no organisation, can do open rescue. Any animal rights activists can do open rescue, no matter if they are affiliated with any organisations or not. 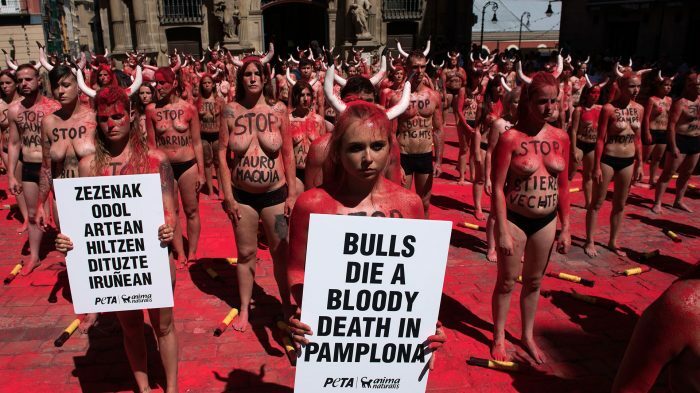 "The real crimes are not committed by us, but by the animal industry." Anonymous is a leaderless group, which means separate individuals, or small groups of people act under the ideals of, and the name, anonymous. Anonymous is famous for activists hacking into computer systems of Governments, businesses or other organisations, and bring them down. They do this to protest against their activities. The Animal Liberation Front also undertake occasional computer hacking of targets, to cause them disruption and cost them money. Anonymous For The Voiceless focuses on exposing and stopping animal cruelty. It is best known for legal street protests, such as the Cube Of Truth. This is where activists stand silently in a square formation, all facing outwards. They typically wear “Anonymous” (Guy Faulkes) masks, and are dressed all in black. 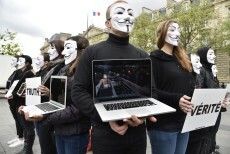 They hold laptops showing videos exposing animal cruelty. They may also hold placards and hand out leaflets. The cube can be big or small. Image: Cube Of Truth protest by Aninymous For The Voiceless. Direct Action Everywhere (DxE) encourages open rescue and investigation, as well as other forms of direct action, such as protest. Rather than standing outside a shop protesting, DxE activists are known for protesting inside the businesses. 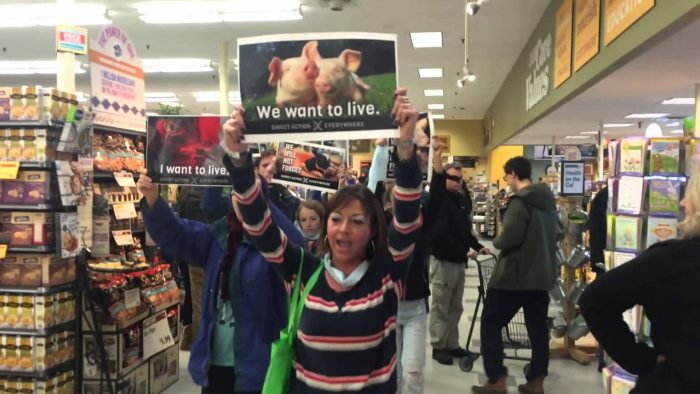 Image: Direct Action Everywhere stage a protest inside a store. They are also known for their disruptive protests, where they interrupt official local Government proceedings or sports games to get their message across and create more publicity. Protesting in public spaces is legal, but when protesters enter private land, they could be breaking the law. DxE also encourages activists to get creative in the way they protest in public spaces. They publicise all their activities to try to expose the lies of companies profiting from animal exploitation and cruelty. Many animal rights and animal advocate groups will take part in direct action. DxE is just one organisation that people are inspired to do it by. Image: An example of creative direct action. 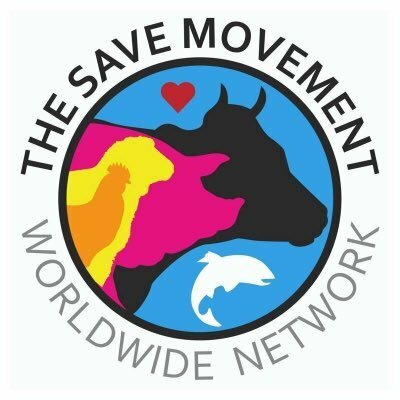 The Save Movement is a worldwide organisation where groups of people attend to animals arriving in trucks at slaughterhouses/abattoirs local to them, giving the dehydrated animals water and comfort before they endure the horror of the slaughterhouse. What they do is legal, and is often through an agreement with the slaughterhouse owner or manager. The aim of the animal save movement is to bring these animals to the attention of the wider public, by publishing their activities online. They want to bring the public face to face with the animals that are suffering because of their food choices. They encourage people to stop the suffering in their name and go vegan. Their website has resources to help. There are hundreds of Save groups across the world. People are encouraged to join an existing group, or start one in their area. It does not matter how many people are in your save group, as long as you can publicise your activities. Sometimes just a single person does it. 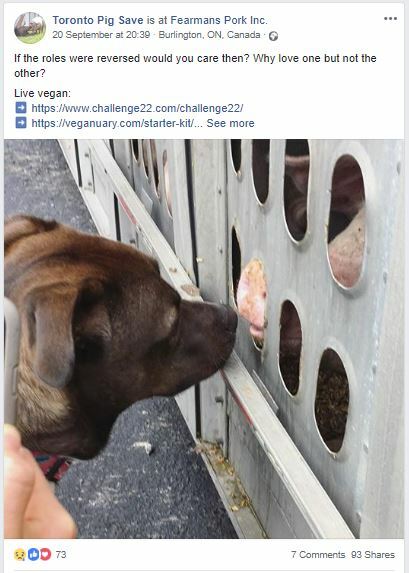 There are pig save, cow save, chicken save, sheep save, or general animal save groups, probably depending on the animals slaughtered at your local slaughterhouse. Image: A Toronto Pig save post on their Facebook page.